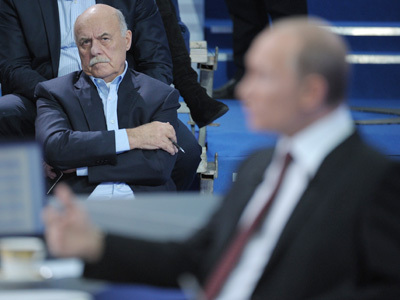 The head of Vladimir Putin’s election headquarters, film director Stanislav Govorukhin, has said that President Dmitry Medvedev is not doing enough to promote his ally Putin in the presidential race. In an interview with the popular Russian daily Izvestia, Govorukhin said he had a feeling that Medvedev was “”keeping mum” and that it would be “more decent” if the president started to actively support Putin, whom he himself put forward as a presidential candidate at a United Russia party convention. “I don’t see his active role and this is strange for me, because this is the same man who offered us Putin’s candidacy for the presidential post,” Govorukhin said. 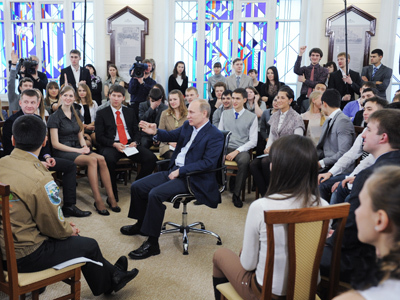 He added that he would like to ask Medvedev about the reasons behind this behavior. The interview was released soon after Medvedev’s meeting with journalism students in Moscow, at which the president suggested that December’s protest rallies were held by those disappointed that Medvedev was not running for the presidency himself. Dmitry Medvedev’s press secretary on Friday refused to comment on Govorukhin’s statement. However, the interview immediately drew comments from parliamentarian Vladimir Zhirinovsky, the leader of the Liberal Democratic party. Zhirinovsky said at the Lower House session that Medvedev’s behavior was absolutely normal, as the head of the state cannot support any of the candidates in the presidential race. “I want to remind Govorukhin that the president cannot by law support anyone as he is the president of the whole country. He is not the president of United Russia, he is not related to it and has the full right to support no one,” Zhirinovsky said. Besides, Zhirinovsky reminded the head of Putin’s HQ that the official propaganda campaign in the mass media only starts on February 4, and only then will there be official talk about supporting the candidates. The parliamentarian also suggested that the position of the authorities must be somewhat weak, if they are so desperate for support. Zhirinovsky is running for the presidency himself as a candidate from the Liberal Democratic party. 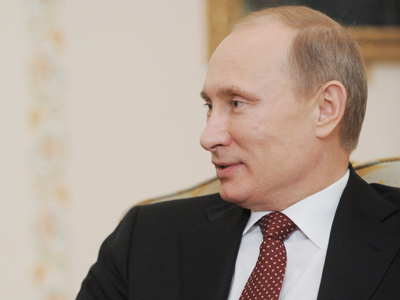 Later on Friday, Vladimir Putin’s press secretary Dmitry Peskov disagreed with Govorukhin. 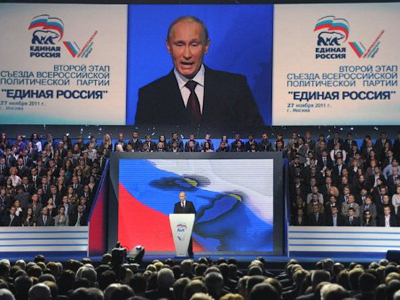 He said Medvedev had already rendered the main and absolute support to Putin, when he suggested the current PM as the presidential candidate from United Russia at the party’s election convention. “The President and Prime Minister are doing real things in regular everyday mode, and the results of these actions are, support to Vladimir Putin as a candidate” – Peskov said.